Simtable creates custom agent-based simulations based on data for wildland fire, storms, evacuation, flood, ecological behaviors and hazmat incidents in your communities. 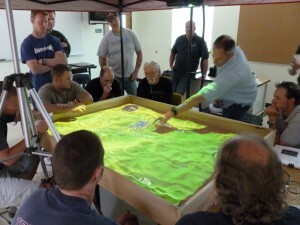 Simtable offers real solutions for interagency planning, training and education for emergency management incidents. Federal, state and private property ownership overlays allow users to plan and prepare for unified incident command staff on multi-jurisdiction incidents. Key information such as existing schools, homes, street networks, office buildings and rail lines can be overlaid, including critical data such as power lines, buried natural gas pipelines, fire hydrants etc. House locations, densities of population, and street networks are used in simulating evacuation plans. Data is relayed through multiple devices in real-time, allowing users to provide inputs from multiple computing devices, whatever their strategic, tactical or operational role. Simtable is focused on bringing these critical, planning exercises to life for participants, allowing them to acquire Incident Command System (ICS) concepts and train on applying them to real threats in their own neighborhoods and cities.